Students, representatives from Civil Society Organizations and social assistance public bodies joined a debate organized by Idesam (Institute of Conservation and Sustainable Development of the Amazon) about the third sector this Thursday (01/13) in Manaus (AM). Besides good management practices, topics such as fundraising and the importance of voluntary work were also discussed and broadly explored with the audience. Carlos Koury, Idesam’s technical manager, was able to share the experience he had in a trip to four cities in the United States (US) to visit the International Visitor Leadership Program, a professional exchange program financed by the country’s Bureau of Educational and Cultural Affairs. 11 Brazilian NGOs formed the delegation and Idesam was the only one representing Brazil’s Northern region. Each year, the program has around 5 thousand participants from different countries and, in 2018, Idesam had the opportunity to follow the visits to 22 non-profit organizations and to learn more about the third sector‘s experience in the US. Among the visited organizations are NGOs that work fighting for social rights, the environment, gender respect and equality, special education, against new forms of slavery and human trafficking to name but a few of the areas of activities. Koury highlighted in his presentation that the North American third sector stands out by its top level of organization and planning, always using fundraising plans and setting targets in addition to their strong expertise in networking and partnerships. The higher engagement of the country’s civil society and lower dependence of government funding were pointed as particularities of the segment in the US. This was one of the points emphasized by many of the present, including the financial director of the Amazonas Autism Institute (IAAM), Joaquim Melo, who works at IAAM which has been assisting children and teenagers for eight years. With around 200 monthly services, IAAM directly assists 60 juveniles. “Whoever is here and works with this public knows the difficulty of getting resources to maintain the project, so one of the solutions we found was to try to work with campaigns that could touch the public”, he says. Raising awareness is important in Ana Cristina de Oliveira’s point of view, executive coordinator of Fundação Vitória Amazônica. According to her, strengthening the concept of social responsibility among private companies in Brazil is key, but Civil Society Organizations are still target of discredit. She also highlights the importance of strengthening voluntary work in the country, another lesson that can be learned from the US. But beyond the importance of responsible volunteering in the third sector, the entities that were present raised the topic of administration and good management of Civil Society Organizations, something that several times can block the access to grants. “I notice that institutions want to participate (of public notices), but many times they are not organized to receive these resources. It is not unusual to witness the access to resources being denied by lack of documentation”, highlighted the president of the Social Assistance Municipal Council, Jaqueline Santos Ferreira. Representing the Association of Housewives of Amazonas (ADCEA), Neuda Maria de Lima shared her experience of over 20 years in the third sector, stating that one of the mistakes it is to not think with caution on legal assistance costs, what might be a challenge for future managers. 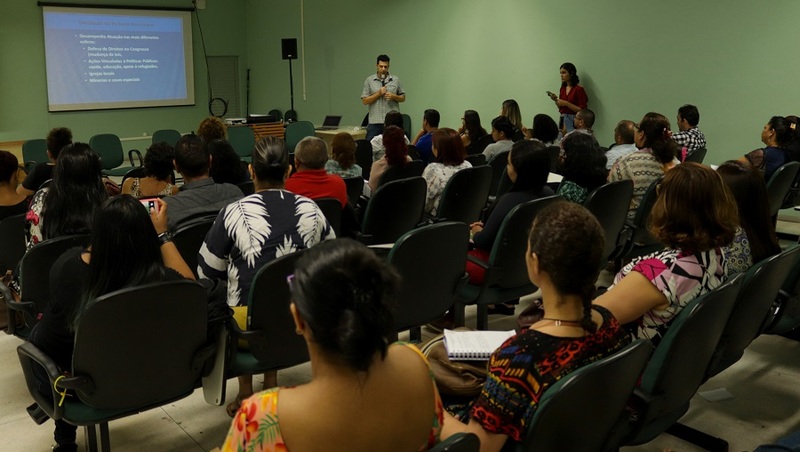 Entirely free, the event organized by Idesam’s social worker Marilete Chota, took place at the rectory’s auditorium of the University of the State of Amazonas (UEA) and counted on a team of experts to share their knowledge with the attendees. In addition to the ones already mentioned, representatives from the State Secretariat for Social Assistance and Citizenship (SEAS) and the US Consulate, Sherre Prince Nelson, participated in the debate.